Mine shoots great. I am very happy with it. Ncg is amazing with all her knowledge. I'm glad she's here with us. Thanks, Dave. Glad to be here, too, with all my pals. My S397 Benjamin/Sheridan is no longer pumping up. I just noticed it this morning getting ready to dispatch some critters around my sheds foundation. It was working good last week when I got 2 of them from 25 yards out. This morning there was barely any pressure built up, and it felt like it was pushing back the pump handle as it was on the intake stroke. Can I get, or do I need a rebuild kit? ^^^^^^ I know its not a Silver Streak. I think that you should contact the manufacturer to find out what's going on with your air rifle. Maybe they offer a factory rebuild. I'm sure it's a seal. They are usually easy enough to replace. I'd call Crosman and see what they say. There are probably seal replacement kits available, I've never looked. Ok, thanks guys for the suggestions. Got to make that call, and try to get someone on the other end that knows the history of this weapon. Its a transitional rifle. I think its mostly Benjamin. Think its pre 1995. No plastic anywhere including trigger guard. Got other things going on, but I need to get on this, and get some parts coming my way. The vermin, chipmonks, and boomers know that this weapon is OOC. I Have a Probably early 70's Sheridan Blue Streak that a friend just gave to me back then. I've had and used it a lot over the years. Quite accurate. One of my favorite rifles. Other than going on line though, I rarely see .20/5mm pellets available. Luckily my last couple tins came from Amazon. The only problem other than having seals replaced, only once, has been the barrel separating from the air chamber. Sent it out to a guy in Arizona some years back for repair, but it has now happened again. Don't know if he's even around anymore. Love that air rifle though and like NCG said a while back, 5 or 6 pumps gets the job done. Don't forget to lube the pump piston as per proper maintenance. A dried out seal behind the piston won't do a proper job of getting pressure up. I've brought some old pumpers back to life simply by doing this routine maintenance thing. Also, ALWAYS put the pumper away with a couple of pumps of air in the reservoir. This maintains seal integrity. It's also a good way to check seal integrity. If the gun won't hold its pressure for a couple of days or so, time for a seal kit. Do yourself a favor on a Blue Streak and get the JSB Exact Match 20 cal pellets from pyramid air. Makes every other 20 cal pellet I've tried in a Sheridan look bad, especially the Benjamin 20 cal pellets you can buy currently. 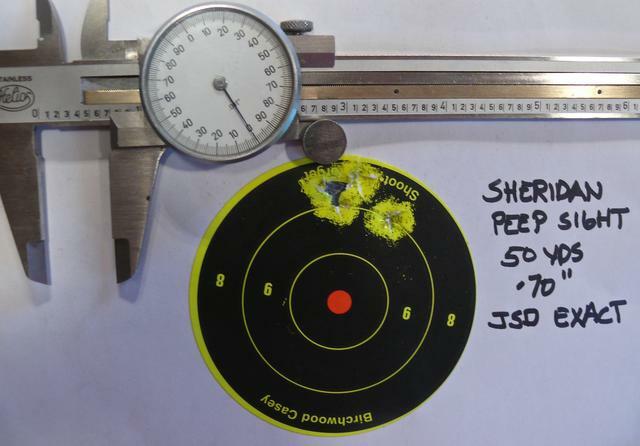 I get terrific accuracy with this JSB 20 pellet in all my Sheridans, as in in 1" groups or less way out there at 50 yards. It is possible. Believe it or not, a home remedy that has worked for me on barrel separation is good old JB Weld. Picked up this tip on another forum, because I had a Blue Streak with the same problem of separation right above the breech. Not pretty, but the JB has been holding for a couple years, now. This one os a shooter for me, so the JB fix is good enough. If it happened on one of my collectible grade Sheridans, I'd have it done right and brazed. Put the gun in a clamp over the receiver area, then let the JB setup for a couple of days and back in business. While I was at it, even JB'd the scope mount on so it wouldn't wiggle. Like I said, this one is strictly a shooter for me, but, hey, it does a great job. Thank you soo much NCG. Mine is a shooter as well so not too concerned about esthetics. Will look for those pellets as well. My seals still seem to be ok because I have left it pumped for a couple days at a time and when I shoot, it still seems to maintain velocity. Always wanted to scope it but never knew what set up to use. 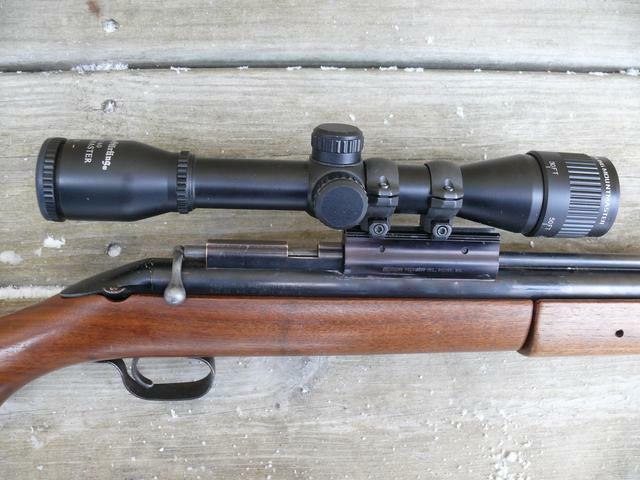 First things first though so maybe you can guide me on that later on after I get it repaired to be scope worthy. you've been a GREAT help! so thank you again! I'm on a mission now after your help.